Striker Didier Drogba is unhappy at Chelsea and wants to leave the club, according to France Football magazine. In an interview due to be published on Friday, Drogba, 29, says morale is low since Jose Mourinho left as manager. "I want to leave Chelsea. Something is broken with Chelsea," said Drogba. "The damage is big in the dressing room." But Chelsea said: "Didier signed a new four-year contract last year. As a top professional we're sure he is committed to Chelsea and intends to honour it." France Football is a well-established magazine in France that awards the Ballon d'Or for the European Footballer of the Year. 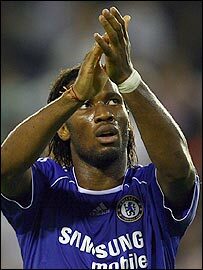 Drogba joined Chelsea from Marseille for £24m in July 2004 and has been the subject of regular speculation since then despite a prolific record with the Blues. He signed his new deal last November but told the BBC the following month that he had considered leaving the previous summer in the wake of Chelsea's second successive league title. In the France Football interview, Drogba is quoted as saying he wanted an even earlier exit and will not change his mind even if the club make high-profile signings next summer. "Nothing can stop me from leaving now," he said. Drogba says Barcelona, Real Madrid, AC Milan or Inter Milan would be his preferred destination. "Since the day I arrived, I wanted to leave Chelsea and then again every summer," he said. "I know that Ronaldinho and Kaka are linked to come next season but even that won't change my mind."